2 litre moulded tank made in one sheet metal no welding in tank, machine come 20 mindigital timer and heatercut off 45 digree. 2 Liter Molded Tank offered comes developed in superior grade single sheet metal finish with no welding in tank which make these more dependable in terms of performance and working efficiency. We offer these tanks with support of digital timer and heater cutoff support. 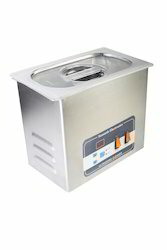 Some of its features include tank comes molded in 45 degree finish, allows for power adjustable support, offers precise cleaning work, option of choosing suitable sonic power as per the requirements of objects to be cleaned. Looking for 2 Litre Moulded Tank ?